The hand held Wile moisture meters are made for reliable and precise moisture control for grain, hay and silage as well as solid bio fuels. The history of Wile goes back to the year 1964 when the Wile grain moisture meter design was patented by the Finnish innovator Matti Wilska. As a result of continuous development the portable Wile meters are today a whole family of products that are available for most grains and seeds in almost all agricultural areas around the world. 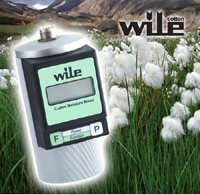 Wile grain moisture meters use the capacitive measurement principle that allows measurement of whole grains. Aside of grain seeds they can measure various oil seeds and many special commodities like coffee beans, spices and new bio fuels seeds like Jatropha Curcas.